I know, I know. Homemade marshmallows are so three years ago. But gourmet marshmallows are freaking expensive no matter how pretty they look and homemade marshmallows are like a blank canvas, the possibilities are endless. Bacon? yeah sure why not, if you are one of those that believes bacon should go in everything. Any and every cordial and liquor I might have in my cupboard? Why not, if I was so inclined. But this is my first time out so I erred on the side of caution. What goes great in hot cocoa? Satsuma Oranges because we have a ton of them around- and Stout- because I’ve been to far too many winter beer tastings in the past few weeks. These marshmallows have a toasty taste, almost smokey. Once dusted with the cocoa and sugar they were like a s’more sans graham. Not necessarily something I would snack on solo but deliciously lovely in hot cocoa. For gifts this year I boxed up the marshmallows and accompanied them with a jar of homemade hot cocoa mix. For the bloom, sprinkle the gelatin in the bowl of a stand mixer. Add the beer and vanilla extract. Whisk or stir until no lumps remain. Set the bowl back into your mixer and fit the mixer with a whisk attachment. For the sugar syrup , pour the beer into a 6-quart saucepan or larger and simmer until reduced to about half. Add sugar, salt, and corn syrup. Do not stir. Cook over moderate heat until mixture reaches 240 degrees. This really does bubble up in a dramatic fashion, thus the large pot. Remove from heat and with the mixer on low speed, carefully pour the sugar syrup down the side of the bowl into the gelatin bloom. Remember to use caution, this is essentially a vat of molten sugar. Slowly turn the mixer to high once all the syrup has been added and let it whip for 6-8 minutes, until it looks like a thick glossy meringue. Pour the marshmallow into the pan and let it cure, uncovered, for 10-12 hours or overnight. You will be tempted to scrape every last bit out, don’t do it. Once you have most of the mixture out put the bowl in the sink and soak it. 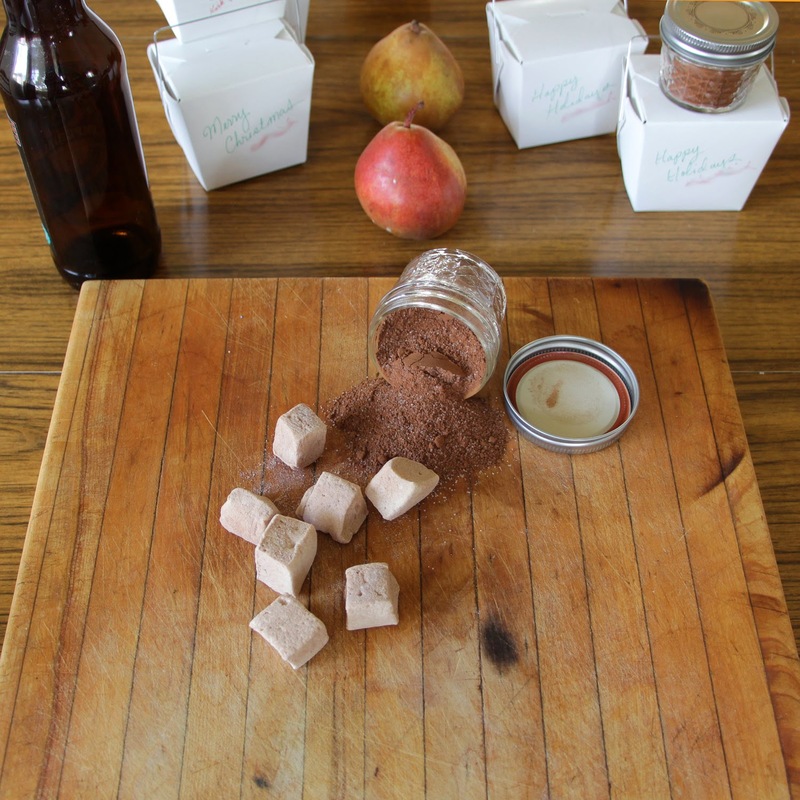 When the marshmallows are cured, dust generously with cocoa powdered sugar and turn the marshmallows out onto a cutting board. Cut into squares of equal size. Marshmallows will keep in a covered airtight container for several weeks. 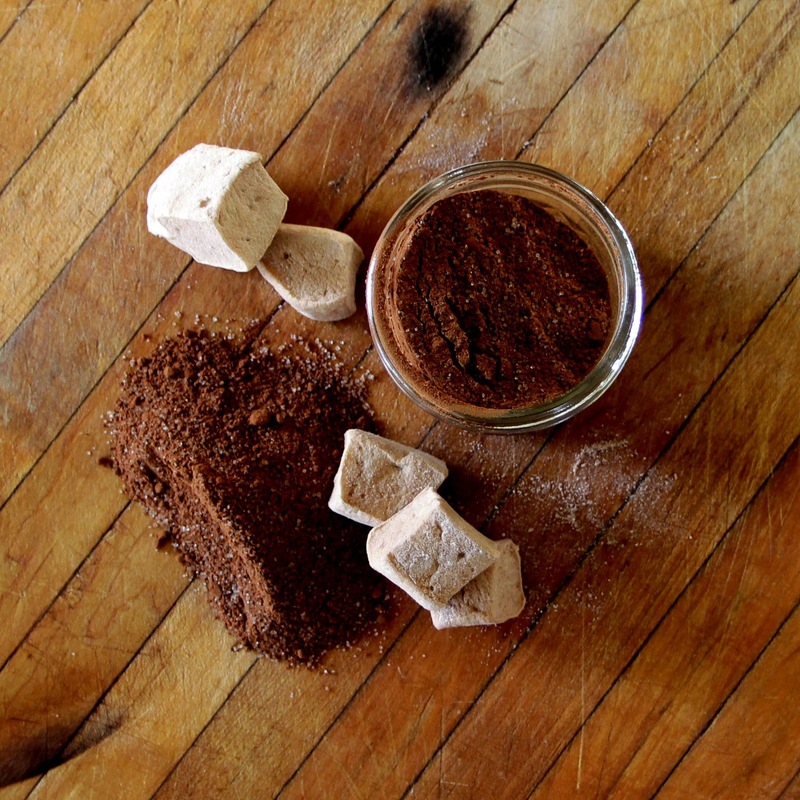 Hot Cocoa Mix- this errs on the chocolate side of things. Most recipes call for considerably more sugar, as always, feel free to tinker. store in an air tight container, or several if you’re gifting. 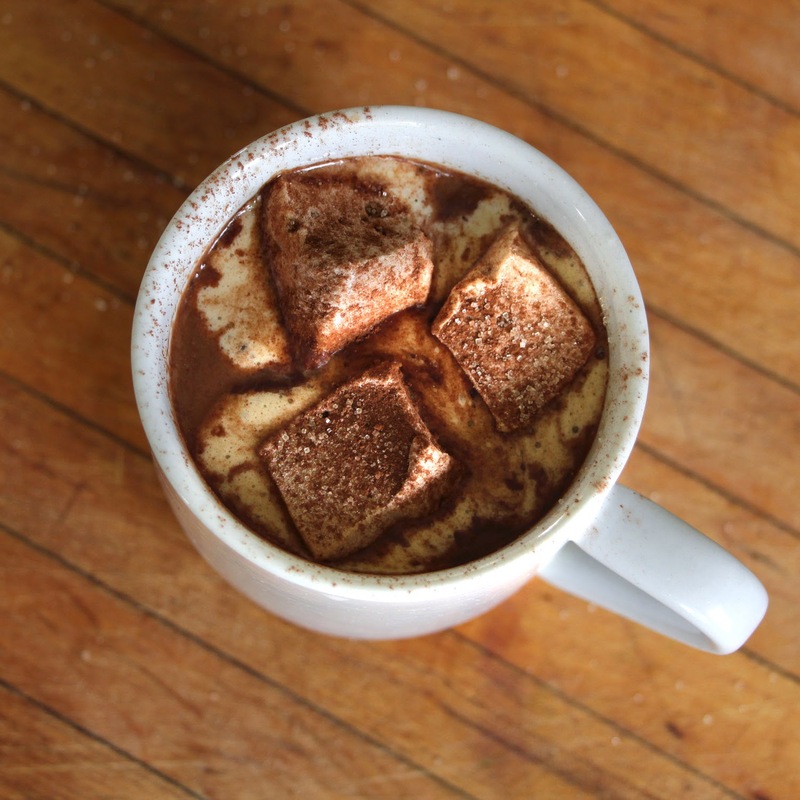 To make the cocoa combine three tablespoon of the hot cocoa mix with milk in your favorite mug. The mix won’t combine smoothly until the liquid is hot so just give it a brief stir and then put it in the microwave and heat. Stir again after it’s piping hot. Top with marshmallows and enjoy. You can also make the cocoa on the stove top, which works much better for a crowd.